Featherstone Rovers have signed Papua New Guinea international Thompson Teteh for the 2019 season. The 29-year-old centre was part of the Kumuls 2017 World Cup squad and PNG’s gold medal winning rugby league nines team at the 2015 Pacific Games. Teteh is a former teammate of fellow Rovers signings Ase and Watson Boas at both international level and for PNG Hunters. He has also appeared at Redcliffe Dolphins, the Intrust Super Cup’s most successful side. “We are delighted to have brought Thompson Teteh in for the 2019 season," said Rovers general manager Davide Longo. “He is an exciting and powerful player, who has experience at the highest level." Longo feels that the Featherstone's latest signings have put the club in a strong position heading into next season. And the Rovers general manager has promised more additions before the 2019 campaign. 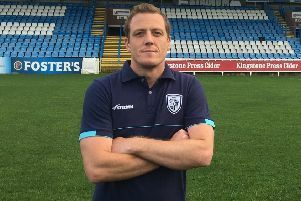 “The addition of those qualities, added to the Championship exposure of our recruits from Batley and the enthusiastic hunger of the academy stars we have signed, means our team for next season is striking the perfect balance. Teteh is Featherstone Rovers’ second addition of the week, after the recruitment of Batley Bulldogs' Brad Day. Teteh is set to join up with the rest of the Rovers squad in January 2019, subject to home office approval.